This article is about the political definition of "metropolis". For other uses, see Metropolis (disambiguation). Not to be confused with Metropolitan area. A metropolis (/mɪˈtrɒpəlɪs/) is a large city or conurbation which is a significant economic, political, and cultural center for a country or region, and an important hub for regional or international connections, commerce, and communications. The term is Ancient Greek (μητρόπολις) and means the "mother city" of a colony (in the ancient sense), that is, the city which sent out settlers. This was later generalized to a city regarded as a center of a specified activity, or any large, important city in a nation. A big city belonging to a larger urban agglomeration, but which is not the core of that agglomeration, is not generally considered a metropolis but a part of it. The plural of the word is metropolises, although the Latin plural is metropoles, from the Greek metropoleis (μητρoπόλεις). For urban centers outside metropolitan areas that generate a similar attraction at smaller scale for their region, the concept of the regiopolis ("regio" for short) was introduced by German academics in 2006. In the ancient world, a metropolis was the city or state of origin of a colony. Metropolis (μητρόπολις) is a Greek word, coming from μήτηρ, mḗtēr meaning "mother" and πόλις, pólis meaning "city" or "town", which is how the Greek colonies of antiquity referred to their original cities, with whom they retained cultic and political-cultural connections. The word was used in post-classical Latin for the chief city of a province, the seat of the government and, in particular, ecclesiastically for the seat or see of a metropolitan bishop to whom suffragan bishops were responsible. This usage equates the province with the diocese or episcopal see. The concept of a global city (or world city) is of a city that has a direct and tangible effect on global affairs through socioeconomic means. The term has become increasingly familiar, because of the rise of globalization (i.e., global finance, communications, and travel). An attempt to define and categorize world cities by financial criteria was made by the Globalization and World Cities Research Network (GaWC), based primarily at Loughborough University in England. The study ranked cities based on their provision of "advanced producer services" such as accountancy, advertising, finance and law. The inventory identifies three levels of world cities and several sub-ranks (see GaWC study). A metropolis is not necessarily a global city—or, being one, it might not be among the top-ranking—due to its standards of living, development, and infrastructure. A metropolis that is also a global city is a global metropolis. Lagos is the most populous metropolis in Nigeria as well as in Africa. In South Africa, a metropolitan municipality or "Category A municipality" is a municipality which executes all the functions of local government for a conurbation. This is by contrast to areas which are primarily rural, where the local government is divided into district municipalities (comparable to a "county" in the US) and local municipalities. There are eight metropolitan municipalities in South Africa. In Morocco there are five metropolitan areas:Casablanca, Rabat, Tangier, Fes and Marrakech are considered Morocco's biggest metropolises. Of these, Casablanca is the largest. In Argentina, Buenos Aires is the principal metropolis with a population of around fifteen and a half million. The Greater Buenos Aires conurbation, which also includes several Buenos Aires Province districts, constitutes the third-largest conurbation in Latin America. Buenos Aires is the main political, financial, industrial, commercial, and cultural hub of Argentina. In Brazil, São Paulo is the principal metropolis with over 20 million inhabitants. In the larger cities, such as São Paulo and Rio de Janeiro (population 6.3 million), favelas (slums) grew up over decades as people migrated from rural areas in order to find work. The term used in Brazilian Portuguese for a metropolitan area is Região Metropolitana. Others metropolises in Brazil with more than one million inhabitants include: Belém, Belo Horizonte, Brasília, Campinas, Curitiba, Feira de Santana, Fortaleza, Goiânia, Manaus, Porto Alegre, Recife, and Salvador. Toronto is Canada's largest city. The City of Toronto has a population of 2.7 million while The Greater Toronto Area is Canada's most urbanized region with a population of over 6 million people. It is also the heart of Canada's finance and banking industry, a global travel hub, and is of major national and global political importance. Statistics Canada defines a census metropolitan area as one or more adjacent municipalities situated around a major urban core where the urban core has a population of at least 100,000. Canada's largest metropoles are Toronto, Ontario, Montreal, Quebec and Vancouver, British Columbia. The primary metropolis in Chile is Santiago, with a population of 7 million in the metropolitan area. Santiago is the main political, financial, industrial, commercial, and cultural hub of Chile. In Colombia, Bogotá is the main metropolis with over 13 million inhabitants residing in its Metropolitan Area, which includes boroughs like Soacha, Mosquera, Cota, and Chía. The second metropolis in Colombia is Medellín, which includes such boroughs as Envigado, Itagüi, La Estrella, and Sabaneta. This metropolitan area is known for having the first and only Metro in Colombia, the Medellín Metro. Bogotá has the Transmilenio, a Rapid Transit Metro-bus system. In Mexico, the term metropolis is used to refer to an urban area of economic, political, and cultural importance. Mexico City represents all three factors as it is the country's capital and financial center with 27 million people. Other metropolises are Monterrey and Guadalajara, both metropolitan areas with a population over 6,000,000 inhabitants. The Lima metropolitan area is Peru's capital and largest city with over 10 million inhabitants, more than one third of the total national population. In the United States, an incorporated area or group of areas having a population more than 50,000 is required to have a metropolitan planning organization in order to facilitate major infrastructure projects and to ensure financial solvency. Thus, a population of 50,000 or greater has been used as a de facto standard to define a metropolis in the United States. A similar definition is used by the United States Census Bureau. The bureau defines a Metropolitan Statistical Area as "at least one urbanized area of 50,000 or more inhabitants." The six largest metropolitan areas in the USA are New York City, Los Angeles, Chicago, Dallas, Houston, and Washington, D.C., with New York City being the largest. The capital city, Kabul, has grown to become the country's sole metropolis, and is the only city with more than one million people. In the People's Republic of Bangladesh, there are eleven metropolitan areas: Dhaka North, Dhaka South, Gazipur, Chittagong, Rajshahi, Khulna, Sylhet, Barisal, and Rangpur. Lands are highly priced and residents are considered to have a better urban lifestyle. Special police departments are allotted for the metropolitan cities, and there are city corporations for which mayors are elected for five-year regimes. Most of these cities have population density of 35,000/square mile or more. Dhaka is considered a mega city because its population surpasses 10 million. As of the 2011 Indian census, there are 53 urban agglomerations with a population of one million or more. The top-ten metropolitan areas based on their population are Mumbai, Delhi, Kolkata, Chennai, Bengaluru, Hyderabad, Patna , Ahmedabad, Pune, Visakhapatnam, Surat . Other important cities include Kanpur, Nagpur, Indore, Lucknow, Jaipur etc. The Census Commission defines the qualification for metropolitan city as, "the cities having a population of more than 1 million (one million) and above" and Megacity as, "the cities having a population of more than 10 million and above". In Iran, the metropolitan cities are in Tehran and Mashhad and other cities such as Shiraz, Karaj, Isfahan, Tabriz and Ahvaz. 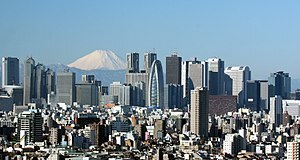 Tokyo - The most populous metropolitan area in Japan. 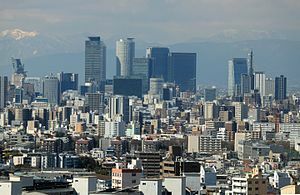 Nagoya is The largest industrial city in Japan. In Kazakhstan, Almaty is the largest city whilst the capital Astana is the second largest, both having populations of over one million each. In Pakistan, the major metropolitan cities are Karachi , Gawadar , Lahore, Faislabad, Multan, the twin cities of capital Islamabad and Rawalpindi. Metropolitan Manila, or Metro Manila, is the metropolitan region encompassing the city of Manila and its surrounding areas in the Philippines. It is composed of 17 cities namely Manila, Caloocan, Las Piñas, Makati, Malabon, Mandaluyong, Marikina, Muntinlupa, Navotas, Pasay, Pasig, Parañaque, Quezon City, San Juan, Taguig, Valenzuela and Pateros. The region is the political, economic, social, cultural, and educational center of the Philippines. As proclaimed by Presidential Decree No. 940, Metro Manila as a whole is the Philippines' seat of government but the city of Manila is the capital. The largest city in the metropolis is Quezon City, while the largest business district is the Makati Central Business District. Taipei - the most populous metropolitan area in Taiwan. Taipei, the largest city in the Republic of China (Taiwan), is the political, economic, and cultural center of the Taiwanese. The Taipei–Keelung metropolitan area consists of 4 administrative regions (Taipei, New Taipei, Keelung, and Taoyuan) with more than 9 million people inhabited. The second largest metropolis in Taiwan is Kaohsiung, which is both the economic and cultural center of southern Taiwan with the largest sea port in Taiwan – the Kaohsiung Port and the second busiest international airport in Taiwan – Kaohsiung International Airport. It has a population of nearly 3 million inhabitants. The Republic of Singapore is a sovereign city-state and a metropolis. In the Republic of Korea there are seven special and metropolitan cities at autonomous administrative levels. These are the most populous metropolitan areas in the country. In decreasing order of the population of 2015 census, they are Seoul, Busan, Incheon, Daegu, Daejeon, Gwangju and Ulsan. According to the census of 2015, cities of Changwon and Suwon also qualify for being elevated to the level of metropolitan cities (having population over 1 million), but any future plans to promote them into metropolitan city are unlikely to be accepted because of political concerns about the structure of administrative divisions. There are also some county-level cities with increasing population near 1 million, namely Goyang, Yongin, and Seongnam, but they are also unlikely to be promoted into metropolitan city because they are all satellite cities of Seoul. The City of Colombo is the largest city in Sri Lanka. The Colombo Metropolitan Area is Sri Lanka's most urbanized region with a population of over 5 million people. There are 8 metropolises in the UAE: Dubai, Abu Dhabi, Sharjah, Al Ain, Ajman, Ras Al-Khaimah, Fujairah and Umm Al-Quwain. Of these, Dubai is the largest. Tashkent is Uzbekistan's most populous city and the only with over one million residents. Prague is the Czech Republic's only metropolis, with more than 1.3 million people living within the city limits and with more than 2.6 million living in its metropolitan area. This makes the Prague metropolitan area one of largest in Europe. In Denmark the only metropolis is the capital, Copenhagen, situated in the Capital Region of Denmark. It has more than 750,000 people living in city proper and 1.28 million in its urban area. Finland's capital, Helsinki, along with the neighboring areas forms a metropolitan area with an approximate population of 1.45 million people. This area is the only metropolis in the country. A 2014 law allowed any group of communes to cooperate in a larger administrative division called a métropole. One métropole, Lyon, also has status as a department. France's national statistics institute, Insee, designates 12 of the country's urban areas as metropolitan areas. Paris, Lyon and Marseille are the biggest, the other nine being Toulouse, Lille, Bordeaux, Nice, Nantes, Strasbourg, Rennes, Grenoble and Montpellier. Berlin is Germany's largest city. Rhine-Ruhr is Germany's largest metropolis (the photo shows Dortmund). Frankfurt is one of Germany's most important cities. The largest German city by administrative borders is Berlin, while Rhine-Ruhr is the largest metropolitan area (with more than 10 million people). The importance of a city is measured with three groups of indicators, also called metropolitan functions: The decision making and control function, the innovation and competition function, and the gateway function. These functions are seen as key domains for metropolitan regions in developing their performance. In spatial planning, a metropolis is usually observed within its regional context, thus the focus is mainly set on the metropolitan regions. These regions can be mono central or multi central. Eleven metropolitan regions have been defined due to these indicators: Berlin-Brandenburg, Bremen-Oldenburg, Dresden-Halle-Leipzig, Frankfurt-Rhine-Main, Hamburg, Hannover-Braunschweig-Göttingen-Wolfsburg, Munich, Nuremberg, Rhine-Neckar, Rhine-Ruhr (with Cologne/Bonn), and Stuttgart. Budapest has a population of 1 750 000, more than eight times the population of the second largest city, Debrecen. As of January 1, 2015, there are 14 "metropolitan cities" in Italy. Rome, Milan, Naples and other big cores have taken in urban zones from their surrounding areas and merged them into the new entities, which have been home for one out of three Italians. The provinces remained in the parts of the country not belonging to any Città Metropolitana. The Union of Polish Metropoles (Polish: Unia Metropolii Polskich), established in 1990, is an organization of the largest cities in the country. Currently twelve cities are members of the organization, of which 11 have more than a quarter-million inhabitants. The largest metropolitan area in Poland, if ranked solely by the number of inhabitants, is the Silesian Metropolis (in fact a metroplex), with around 3 million inhabitants (5 million inhabitants in the Silesian metropolitan area), followed by Warsaw, with around 1.7 million inhabitants in the city proper and 3.1 million in the Warsaw metropolitan area. The Silesian Metropolis is an initiative of recent years attempting to unite a large conurbation into one official urban unit. Other Polish metropoles are Kraków, Łódź, Wrocław, Poznań, Tricity, Szczecin and Bydgoszcz. Spain has around 15 metropolitan areas with a population greater than 500,000 people. The largest metropoles with populations greater than a million people are Madrid, Barcelona, Valencia, and Sevilla. Romania has one big metropolis, Bucharest with a population greater than 2,500,000 people. Other metropolitan areas with populations greater than a half million people are Cluj-Napoca, Iasi, Timisoara, Brasov, Constanta and Craiova. In Turkey the metropolitan cities are described as "büyükşehir". There are 30 metropolitan municipalities in Turkey now. The largest by far is İstanbul, followed by Ankara, İzmir and Bursa. In the UK, the term the Metropolis was used to refer to London, or the London conurbation. The term is retained by the London police force, the Metropolitan Police Service (the "Met"). The chief officer of the Metropolitan Police is formally known as the Commissioner of Police of the Metropolis. Since 1974 six conurbations (outside London) have been known as metropolitan counties, each divided into metropolitan districts. Other conurbations in the United Kingdom are also sometimes considered to be metropolitan areas, most notably the West Midlands (centred on the city of Birmingham), West Yorkshire (centred on the city of Leeds), Merseyside (centred on the city of Liverpool),Greater Manchester and Greater Glasgow which make up the most densely populated areas in the British Isles outside London. The Government of Australia defines a metropolitan area as any statistical division or district with a population of more than 100,000. According to this definition, there are at least 16 metropolitan areas in Australia, including every state capital. By population the largest of these metropolitan areas is Sydney (urban area population at 2016 Census of 5,029,768) and the smallest is Darwin, Northern Territory (Urban area population at 2016 census of 145,916). In France, Portugal, Spain, and the Netherlands, the word metropolis (métropole (Fr.) / metrópole (Port.) / metrópoli (Spa.) / metropool (Dutch)) designates the mainland part of a country situated on or close to the European mainland; in the case of France, this means France without its overseas departments. For Portugal and Spain during the Spanish Empire and Portuguese Empire period, the term was used to designate Portugal or Spain minus its colonies (the Ultramar). In France métropole can also be used to refer to a large urban agglomeration; for example, "La Métropole de Lyon" (the Lyon Metropolis). ^ Keri Blakinger (March 8, 2016). "From Gotham to Metropolis: A look at NYC's best nicknames". Daily News. New York. Retrieved August 6, 2017. ^ "Definition of Metropolis". Oxford Dictionaries. Retrieved March 2, 2016. ^ "Definition of metropolis". Collins English Dictionary. Retrieved October 23, 2012. ^ Prof. Dr. Iris Reuther (FG Stadt- und Regionalplanung, Universität Kassel): Presentation "Regiopole Rostock". December 11, 2008. Retrieved June 13, 2009 (pdf). ^ "metropolis, n." OED Online, Oxford University Press, June 2017, www.oed.com/view/Entry/117704. Retrieved December 19, 2017; "polis, n.2." OED Online, Oxford University Press, June 2017, www.oed.com/view/Entry/146859. Retrieved December 19, 2017. ^ "Censo 2010. Resultados provisionales: cuadros y gráficos" (in Spanish). Archived from the original on December 20, 2010. Retrieved February 25, 2011. ^ "About Buenos Aires". EnjoyBA. Retrieved August 17, 2015. ^ "census metropolitan area (cma) and census agglomeration (ca), 2001 census". 2.statcan.ca. Retrieved October 29, 2012. ^ "South Asia – World Population Day – July 11(South Asia Urban Growth)". World Bank. Retrieved October 29, 2012. ^ "Population of UAs/Towns" (pdf). he Registrar General & Census Commissioner, India. p. 3. Retrieved July 28, 2014. ^ "Local Government in Japan" (PDF). Council of Local Authorities for International Relations. p. 41. Archived from the original (PDF) on October 25, 2007. Retrieved October 16, 2007. ^ "Philippine Development Plan 2017–2022, Chapter 3: An overlay of economic growth, demographic trends and physical characteristics" (PDF). National Economic and Development Authority. 2017. Retrieved April 21, 2018. ^ 鄉鎮市區人口及按都會區統計. Taiwan Ministry of Interior. 2013. ^ "高雄市政府主計處全球資訊網 – 首頁". dbaskmg.kcg.gov.tw (in Chinese). Archived from the original on May 11, 2016. Retrieved June 6, 2016. ^ Kumarage A, Amal. "Impacts of Transportation Infrastructure and Services on Urban Poverty and Land Development in Colombo, Sri Lanka" (PDF). November 1, 2007. Global Urban Development Volume 3 Issue 1. Retrieved August 24, 2018. ^ "The 10 Traits of Globally Fluent Metro Areas" (PDF). 2013. Brookings Institution. Archived from the original (PDF) on April 2, 2015. Retrieved August 24, 2018. ^ "Colombo: The Heartbeat of Sri Lanka/ Metro Colombo Urban Development Project". March 21, 2013. The World Bank. Retrieved August 24, 2018. ^ "Turning Sri Lanka's Urban Vision into Policy and Action" (PDF). 2012. UN Habitat, Chapter 1, Page 7. Archived from the original (PDF) on March 4, 2016. Retrieved August 24, 2018. ^ "United Arab Emirates: metropolitan areas". World-gazetteer.com. Archived from the original on August 25, 2009. Retrieved July 31, 2009. ^ "Database – Eurostat". European Commission. Retrieved December 4, 2018. ^ "Statistikbanken". statistikbanken.dk. Retrieved December 4, 2018. ^ Brutel, Chantal (January 18, 2011). "Un maillage du territoire français" [A network of French territory] (in French). Institut national de la statistique et des études économiques. ^ "Initiativkreise Europäische Metropolregion in Deutschland: IKM". Deutsche-metropolregionen.org. Retrieved October 29, 2012. ^ "How Italy puts cities in charge". ^ "1217.0.55.001 – Glossary of Statistical Geography Terminology, 2003". Australian Bureau of Statistics. ^ Statistics, c=AU; o=Commonwealth of Australia; ou=Australian Bureau of. "Media Release – Ten years of growth: Australia's population hotspots (Media Release)". abs.gov.au. Archived from the original on September 30, 2017. Retrieved January 20, 2018.